Who Is the Ebook Villain, Apple or Amazon? The US Department of Justice (DOJ) says that after the big five publishers signed agreements with Apple, the price of ebooks went up. They say that this shows an agreement by the parties to fix prices. The evidence was hidden by personal meeting, phone calls, etc. leaving little paper trail. The cause and effect appear to be a strong case - except that without any evidence, the argument is circumstantial. If this goes to trial, we can expect a lot of sworn testimony under oath to be requested by the DOJ. I would find the news a great source of background details that generally never get revealed. Apple and the rest may find the exposure unpleasant, even if it is not found guilty. Why would Apple risk exposing itself? This is a secretive company that likes to control any release of information to the press. It can't be the desire to prove it did nothing wrong. Apple is a business, and it makes decisions based on future business plans. Giving up either affects its plans for how selling helps Apple or how the other plan help its competition too much. The defense of the plan can help Apple by strengthening its allies, the book publishers. Apple and the publishers traded support. Apple backed the publishers' pricing model, and in turn they promised Apple the lowest rates. Breaking that relationship weakens the goodwill they shared, and it ends the "most favored nation" status Apple has under these agreements. Apple hates to compete on price, because it hurts the Apple brand. This is a big factor in Apple's behavior. On the other side, Amazon benefits the most from low prices. Its Kindle is still the best selling ebook reader hardware. The cheaper it can sell ebooks, the better it makes the Kindle. It is the standard rule of products and their complements: If you sell cars, you want gas to be cheap. If you sell razor blades, you give away the razor. A cheap price on one side boosts sales on the other side. Amazon wants to boost sales of Kindles by making ebooks as cheap as possible. 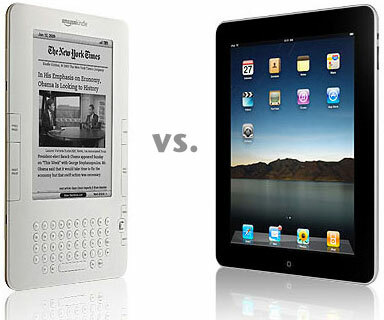 Competition from Apple or Barnes and Nobel is a big negative. These two companies have their own ebook readers (the iPad does quite a few more tricks), and their ebook formats don't have to be compatible with the Kindle. If Amazon has to discount prices to increase its market share, that's okay. However, this predatory business practice was ended by the agreements publishers made with Apple. The DOJ is correct that Amazon's system offered the lowest prices to consumers. The cost of that choice was that Amazon used the arrangement to drive off competition by sometimes selling ebooks below cost. Apple's arrangement makes it possible for publishers to profit from selling ebooks, but someone has to pay for those profits, and that's the consumer. Which is the greater good? Should Amazon be allowed to trash the market price of an ebook, or should publishers be allowed to fix the price of ebooks and use a central figure like Apple to help? The villain depends on your point of view. The average consumer cares only about price. For 10¢ less, they will drive across town for a better deal. From that viewpoint, Apple is the villain for helping publishers raise prices. On the other hand, Apple has created a stronger business model that gives itself a share of the profits. At the same time, higher prices on ebooks make more money for Amazon on each ebook sold. Amazon wants to practically give away ebooks so it can effectively corner the ebook reader market with its Kindle. Clearly Amazon wants to be the villain to the others in the same business. In the long run, you can't go against business. If Amazon wins, they will eventually raise the price of ebooks. Amazon has to show a profit to its shareholders. If the book publishers win, business goes on the same. All the DOJ can hope to do is create temporary relief for the consumer.